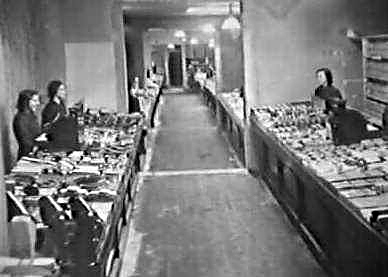 These two images, courtesy of Steve Johnson's CyberHeritage, show the inside of Woolworth's temporary store. It was stepped all the way through. The top image is looking down the store, with the exit to Fore Street at the bottom. The lower image is looking up through the store. Look at the number of staff! There was one to each counter in those days. In March 1946 F.W. Woolworth’s applied to redevelop the bombed site of the Royal Hotel in Fore Street, but their application was turned down as the Admiralty required the land. 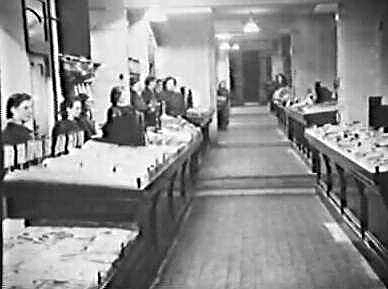 Woolworths opened their new shop at number 9 -11 Marlborough Street in September, 1960. Mr D.C. Davies was appointed as manager to the Marlborough Street store in October, 1969. Woolworth's ceased trading at Marlborough Street and vacated the store in ? (believed early 1970s? Does anyone know exactly when?) 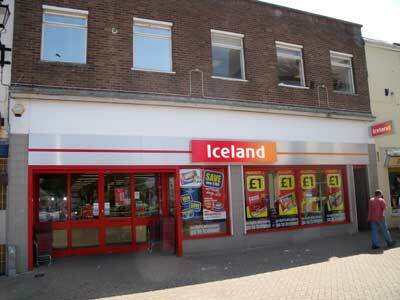 The building, shown below, is currently in use by Iceland. (Do you have any stories to tell about Devonport Woolworth's? We'd love to hear from you). My name is Debbie and I worked at Marlborough St - Woolies from 1980 until approx October 1986 as I had my son in March '87,so I took voluntary redundency. I just thought I'd let you know it was still open for a few years after I left as you seemed to think it possibly closed in the 1970's ? ?